Follow Alberto Manguel on a journey through forbidden material and the writers who risk their lives to challenge society. Bangladeshi author, Taslima Nasrin, writes in hiding for fear of her life. Videos of police brutality by Egyptian blogger, Wael Abbas, attract the scrutiny of a government. Danish cartoonist, Kurt Westergaard, caused international furor over his depictions of the prophet Mohammed. Barney Rosset of Grove Press defied Comstock law to publish Henry Miller and D.H. Lawrence. History and modern media is riddled with authors who fight for truth and ideas that challenge society. Alberto Manguel takes us on a journey through these and other forbidden works, including the scandalous for it's time, Madame Bovary by Flaubert, and the Nazi book burning. This broad look at censorship, forbidden reading, and the writers behind it, is in itself threatened by what it discusses, using explicit language and imagery, mature themes, and short violent scenes to demonstrate the point. How have these forbidden works touched your life? Where do we draw the line? After watching this, will your opinions be the same? Challenge yourself and your beliefs with this 52 minute DVD. 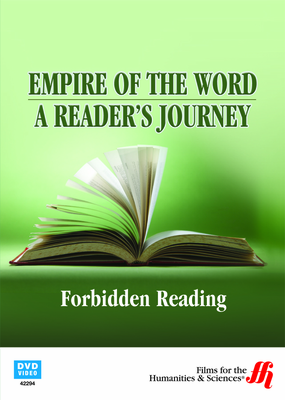 A part of the series, Empire of the World: A Reader's Journey. "The danger in a book lies in the eye of the censor."